This story, reproduced in digital by the talented team at Oceanhouse Media, was published by Dr. Seuss's in print in 1938. It focuses on one Bartholomew Cubbins, a poor boy who has just one hat, "an old one that had belonged to his father and his father's father before him ... (and) was probably the oldest and the plainest hat in the whole Kingdom of Didd, where (he) lived." 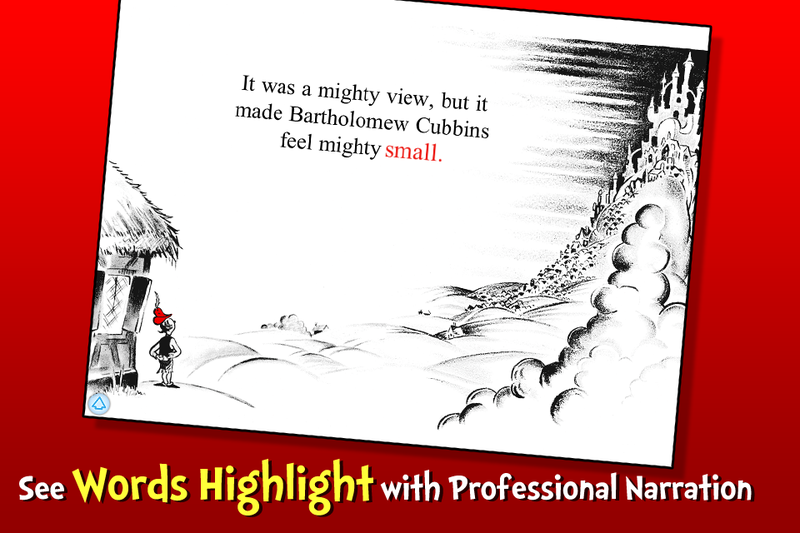 Much wordier than the typical Seuss title, this app is a must download for any serious collector but might not suit the tastes of the average reader. The 500 Hats of Bartholomew Cubbins is unique in many ways, diverting from the author's typical work significantly. I love Seuss, but I must admit this is my least favorite of all the book apps I've read. It features no rhyming on poetic meter and the illustrations are also much less detailed than other Seuss books. It is only black & white sketches with a touch of red and the word count in this unusual prose title comes close to a chapter book. When timing this app on autoplay it exceeded 30 minutes, which also makes this a difficult app to recommend for bedtime. Poor Bartholomew is confronted with a dilemma when he takes his hat off for the King, yet somehow a hat is still on his head (even though he has his hat in his hand) ... many more attempts to remove his hat simply increases the number of hats (up to 500), but the repetition is more tedious than tantalizing as a plot theme. I tend to agree with critics who say Seuss should have stuck with rhyme ... his prose is lacking somehow and this titles seems to go on and on like a bad Saturday Night Live skit. 500 Hats does have top-notch features from Oceanhouse Media in app form. Enhancements are primarily educational and focused on word recognition, although lots of interesting sound effects are also connect the images with word meanings for young listeners. Great narration with highlighting word-by-word reinforces the text and if a child taps on any word, they can hear it spoken again. If you tap on an image in the illustrations, the word will appear with accompanying audio. And as a bonus, if that image is present in the text of the story, the word will highlight again, too. In digital form, most Dr. Seuss OmBooks also aren't animated in any way, but many pages begin by panning over Seuss' classic original artwork, zooming in and out to show off each chunk of text in a nicely paced design. Extra features include the ability to record your own narration as well as excellent navigation with a nice visual 'thumbnail' page guide. Ample settings allow adults to set the book up with or without audio and interactive elements. Overall, this Seuss tale is an interesting read ... it is made even more accessible to a new generation with digital enhancements well-suited for a modern audience. The messages within this story (and most Seuss titles) are subtle, making for rich converstation with young people or even extension activities in a classroom setting. This title is different from the typical Seuss, but in many ways that makes it special. 500 Hats represents a very early time in the author's career and features a style that may give insight into his later works. It is not the perfect app for every reader, but any Seuss lover will want to consider downloanding this unique title to their tablet. Set in feudal times, the story begins in the Kingdom of Didd, when King Derwin is riding through a street past Bartholomew Cubbins, a poor boy in the market. Bartholomew removes his hat, according to the laws, but another hat mysteriously appears; when he attempts to remove this one too, another one appears again, and this continues, even as he removes more and more hats, each growing in extravagance and beauty from the 451st hat onwards. Eventually, as Bartholomew is being threatened with death, the 500th hat, studded with massive gems and gilding, comes off and Bartholomew's head is bare again. Stunned by the beauty of the hat, King Derwin grants him reprieve and trades him 500 gold coins for the 500th hat.